A BBC investigation has uncovered the deadly practice of Britons travelling to India to hire contract killers. Family and business associates, who are lured to the sub-continent, are often the targets. In a country where murder is cheaper and less fraught with risk, the perpetrators of these crimes are rarely brought to justice. Campaigners in both India and the UK believe this to have claimed the lives of hundreds of victims over several years. These armchair murder plots are hatched in the living rooms of Britain and executed mainly in the rural Indian state of Punjab. I made the journey to India to investigate these sinister crimes. In a remote village, surrounded by lush green fields, a rickety ox-drawn cart trundles along the dusty lane. It is here that a British woman, who was on holiday with her husband visiting relatives, was killed - the apparent victim of a hit-and-run accident. But her relatives in India suspect foul play. "Her husband wanted to re-marry. He told her to leave him - she said, 'I'll die but I won't let him go'," her mother revealed. She was one of the first to arrive on the scene. "They beat her up. They dumped her in the ditch and made it look like an accident. They wanted to show it like an accident. There was no blood, no car and no tyre marks." Despite a lengthy police investigation, charges are yet to be brought against the suspects in India. For legal reasons, we can not name the victim or her family. 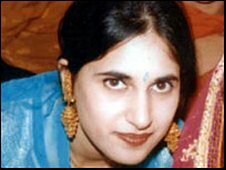 Her killing bears striking similarity to that of another British woman, Surjit Athwal. 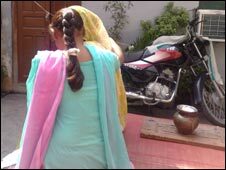 The 26-year-old mother of two disappeared in Punjab in 1998. Two years ago, a British court found her mother-in-law and husband guilty of arranging her murder. They had hired criminals in India to kill her. She was strangled and her body dumped in a river. Her brother, Jagdeesh Singh, now campaigns for other victims' families. 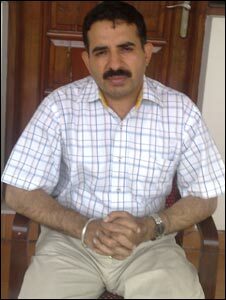 "I think Surjit's case exposed for the first time in this country overseas outsourced killings. How the Punjabi community, settled in Britain, send their females back to the land of origin, in the full knowledge that they can have them murdered easily, swiftly and efficiently." It is not only women that are lured abroad to be killed in these types of murders. Raju, not his real name, recalls his brother's death during a visit to their ancestral village in Punjab. "He was found on the floor, with a bullet in the head. We have evidence to suggest the murder was arranged by his wife and her lover. We believe the motive was to fraudulently claim insurance money." So how easy is it for murder to be outsourced to India? According to Indian journalist, Neelam Raaj, finding a person to carry out the killing is simple. "The person who's taking the contract would just be a small-time criminal. He's usually a goon in the village." In India, murder is cheap, with hired assassins paid up to $800 (£500). Formerly, the modus operandi was a drive-by shooting, now it is likely to be a staged road accident. And it appears there are few risks. In the bustling city of Ludhiana, Jassi Khangura juggles life as a successful entrepreneur with a career in Indian politics. He used to be a businessman in London, now he is an elected representative for the ruling Congress party in the Punjab legislative assembly. "What we have in Punjab - and in many other states of India - is a criminal nexus that takes place between the police, the politicians and the criminals. That nexus gives the Indians that live in the UK a large degree of cover. "Even if they're identified as the perpetrators of the crime, they're given a considerable degree of protection and that means they never get charged." He alleges police corruption in the state is responsible for a trend which he believes claims the lives of up to a 100 overseas Indians a year. But in the manicured grounds of his colonial-style villa in Punjab's capital, Chandigarh, inspector general of police for Jalandhar district Sanjiv Kalra says the figures are exaggerated and denies his force is riddled with corruption. "From my experience, these kinds of things are more talked about than they are actually present on the ground," he said. However, for many victims' families the search for justice in India is elusive. They are now turning to the authorities in the UK for help. British detectives are increasingly being called in to solve these murders. Commander Steve Allen of the Metropolitan Police Service has this stark warning. "We have increased our knowledge of and our confidence in dealing with murders of British citizens overseas. We will follow you, we will pursue the evidence and we will bring you to justice wherever in the world you commit these offences." Meanwhile, the Foreign and Commonwealth Office says it is currently aware of six British nationals who have gone missing in the Delhi and Punjab area. Passport to Murder will be broadcast on BBC Asian Network at 1800 28 September 2009.